Italian Beef – Elly Says Opa! A post about Italian beef sandwiches was one of my first posts ever on this blog – back when its only reader was, well, probably me. Since the post lacked an actual recipe (in terms of measuring ingredients) and picture, I thought I’d take some time to repost a meal that’s incredibly easy to make, and also delicious. 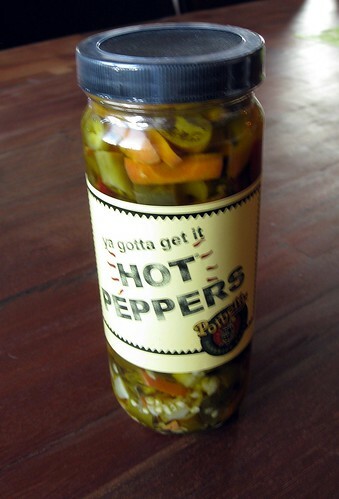 It is especially delicious, in my opinion, when topped with hot peppers/giardiniera from Potbelly. I don’t want to point any fingers or start any lawsuits, but I’m fairly certain that Potbelly’s hot peppers are laced with crack. They have to be; otherwise, I would have some semblance of control when eating them. Italian beef is a very common sandwich in Chicago, said to have originated here. 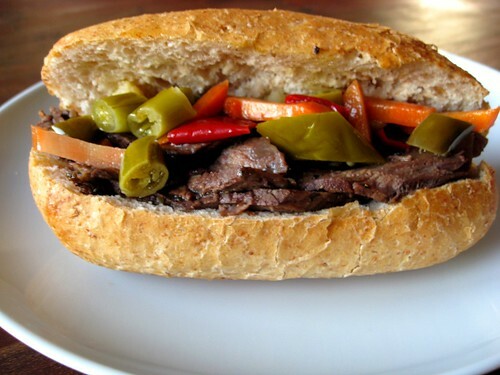 It’s thinly sliced roast beef, usually served with giardiniera (or sweet peppers, if you want) on a roll. You can just have them put just the beef on there, you can have them spoon some of the meat juices on there, or you can even request it dipped, which means dunking the whole thing in the meat juices. That is definitely the sloppiest way to eat it, but also the most tasty in my opinion. I didn’t want to take a picture of a very soggy sandwich but rest assured that I served myself a little cup of juice on the side of this and slowly drenched my sandwich in it as I was eating it. I was working from home the day I made this, so I didn’t start the beef until about 1:00 p.m. I wanted to slice it (even though I could never get those paper-thin slices) rather than shred it. That said, I usually just let this cook all day and shred when I get home to make it an easy weeknight meal. Season the roast liberally with kosher salt and pepper. Add a little olive oil to a large, heavy bottomed skillet and heat it over medium to medium-high heat. Add the roast and brown on all sides. Remove and place in the slowcooker. To the pan, add the garlic and stir just until fragrant – about 30 seconds. Add the broth, herbs, Worcestershire, a little salt if necessary (depending how salty your broth is) and some freshly ground pepper (about 1/2 tsp). Scrape all the browned bits off the bottom of the pan, and then pour the mixture over the roast in the slowcooker. Cook on low for about 4 hours (longer if you prefer the beef to fall apart vs. being sliced). Slice and then place back in the juices for another half hour or so. Serve on Italian rolls, topped with hot (or sweet) peppers.